Because it has become such a part of popular culture, endlessly referenced and parodied, Anthony Hopkins's superb performance in The Silence of the Lambs tends to get overlooked. In the museum of great American stuff, it just IS -- like Mount Rushmore or Snickers bars. Hopkins is one of only three actors to ever receive an Oscar for a performance in a horror movie (The other two are Kathy Bates for Misery in 1990 and Frederic March for Dr. Jekyll and Mr. Hyde in 1931, but that was a tie and he had to share it with Wallace Beery.) Silence of the Lambs stands as the only horror film (of the three ever nominated: the other two are The Exorcist in 1973 and Jaws in 1975. Good Grief.) to win the Best Picture Oscar. Perhaps the film’s rough outline (and Hopkins' amazing performance) convinced the faint of heart that they were actually watching a police procedural. 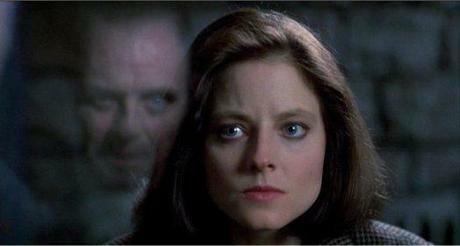 I find many similarities between Jonathan Demme’s Silence of the Lambs and Alfred Hitchcock’s Psycho. Both directors know that the impact of their main character (Hannibal Lecter in the former and Norman Bates in the latter) is actually enhanced by limiting their screen time. Neither character appears until about twenty minutes in, both characters’ scenes are the highlights of their respective films, and both characters give us insight into what a very specific kind of madness looks like. They are both still, small centers that are, inside, teeming with a very different sort of life. Anthony Hopkins is assisted in creating this unique character by the sheer amount that other characters talk about him. At one point Clarice Starling (Jodie Foster) gets a briefing about the dangerously psychotic Lecter, and director Demme pulls off a neat trick that few horror films manage. When we think back on the film that we have just seen, we remember the incidents described as real scenes instead of mere speeches. It is a neat reversal of “show, don’t tell” and it revs up our anxiety before we even meet the character for the first time! 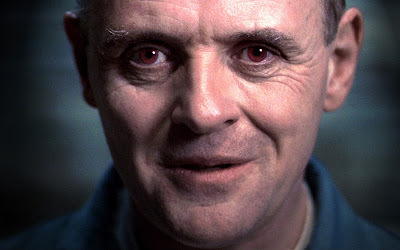 Hopkin’s affect as Lecter is marvelously achieved -- the generic voice, the fact that he never blinks once, and the complete lack of any wasted motion. This I find to be the scariest aspect of the performance: the terrifying quickness with which Hopkins moves from meditation to action. That “breakout scene” in the cell reminds us that our lives can turn on a dime, that good fortune can turn to bad in a flicker of an instant, emphasizing the random nature of our lives. The speed at which bad things sometimes happen is infinitely scarier than having one's liver eaten with fava beans and that nice Chianti. Don't you agree, Clarice -- all good things to those who wait? Great write-up on yes, one of - if not THE - all-time great horror performance. At times his expression captures the intensity of a caged and very hungry lion that wants to eat YOU (especially combined with Demme's use of straight-on shots that has us looking him right in the eyes) - even as familiar as I am with Anthony Hopkins now, I have no doubt when watching him that THAT crazy-smart fucker in the movie eats people. And yeah, like you, I LOVE that line at the end because it so captures the bizarre and paradoxical nature of his twisted ethos and gives us that moment of "Yes! I understand this character too and he WOULD consider that rude." Sigh...so many scary movies I want to watch this month...F it - Scary Movie Year it is! Jodie Foster made him do it. As famous as this movie is, I've never seen it. Thanks for the great review JB, makes me want to see it even more. Hopkins role is so iconic to me that every time I read his name in an article or on a poster, the first that comes to my mind is "Hannibal Lecter". I read somewhere that Anthony Hopkins had a hard time playing that role because the character stayed with him for so long. The thought of struggle with this character outside of the movie only adds to its legend. This movie is in my top five, and a lot has to do with Hopkins. Just the way the camera studies his face, every time we with him the movie slows down. It feels like the filmic version of changing tense in a way. Hopkins is in complete control. Love it, love it, love it!